Rev. John Buehrens is our guest preacher for both services. He and Rev. Jacqueline are doing a pulpit exchange. Rev. 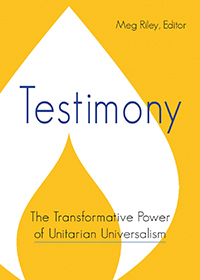 Buehrens was the former president of the Unitarian Universalist Association of Congregations and now is the senior minister of First Unitarian Universalist in San Francisco… He once co-authored, with Rebecca Parker, at the beginning of the Obama presidency, a book with the same title as his sermon. The subtitle was “The Promise of Progressive Religion in the 21st Century.” Now he says he would reframe that to “The Challenge.” This may be one of your last opportunities to hear Rev. Buehrens preach here in Oakland. He plans to retire this coming summer. Jim Briggs is the Worship Associate and music will be offered by pianist – Geoff Ullerich, vocalist – Susan Keiter and Joyful Noise. Come let us worship together. There will be Children’s Chapel in the Starr King Room and then Spirit Art & Games.